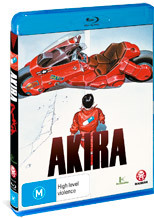 Akira is considered by some, the movie that put anime on the western market and Madman have amazingly released this classic anime on the glorious Blu-ray format which has been painstakingly restored in high definition. Although created in 1988, the story of Akira is still as powerful as ever and was the template of things to come. Set in Neo-Tokyo 2019, a city that was built from the ashes of World War III, more specifically 31 years ago and although the city may look like a modern Utopia during the day but as nightfall comes, the streets are ruled by biker racers who use the streets of Neo-Tokyo as their racetrack. Unfortunately not everything is what it seems in Neo-Tokyo and when a racer named Tetsuo accidentally crashes his bike into a strange looking boy, both are taken away by the military with only Kaneda, the leader of Tetsuo as witness. Unfortunately for Tetsuo and the boy, they were taken away because of their psychic abilities which are eerily reminiscent of Akira, the boy who was responsible for the nuclear blast that decimated Tokyo 31 years ago. As Kaneda attempts to free Tetsuo from the grip of the military, we learn that absolute power corrupts absolutely and although Tetsuo knew that he was different from others, he soon starts taking delight in his new found abilities with devastating results. Of course, Kaneda will either stop or save his friend in order to prevent another disaster that decimated Tokyo, now may threaten Neo-Tokyo itself. With over the top action, mystery and some extremely violent and graphic scenes for its time, Akira was truly a revolutionary film that cemented itself that animation in the west was not just for children. Best summed up as a story of all ages. The animation of Akira for a film of this age is rather impressive and features some great choreography that blurs the boundaries of realism. The video quality is extremely crisp with sharp vibrant colours that is oozing with pure high definition 1080P that must be seen on a large high definition screen to be thoroughly appreciated. Even the sound has received a makeover and with it, another FULL HD audio experience that really makes good use of your surround sound setup, especially some of the action scenes and of course the great motorbike scene at the start. To compliment the restored movie, the Blu-ray contains a few special features like trailers and storyboards but not as near as entertaining as the special edition of Akira. In conclusion, Akira on Blu-ray is a must have disc for lovers of anime or for those who can appreciate animation from a variety of levels. A beautifully written, directed and animated movie, it's easy to see how Akira spawned a world anime in the West.